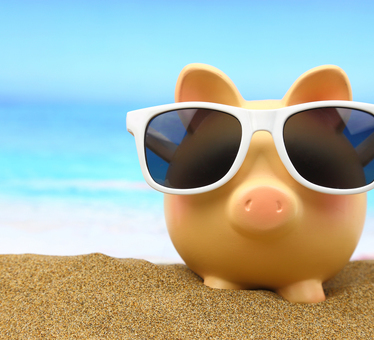 A vacation with sun, sand and the sea are termed as perfect holidays as they have the magic to revive your energy. What comes first to the mind when we talk of beaches is this magical place called Goa. A perfect holiday destination for most of them to just go chill at the beaches. Instead of just lazing around at the beaches, or just attending parties all night find out what more cool stuff can you try while at Goa. 1. 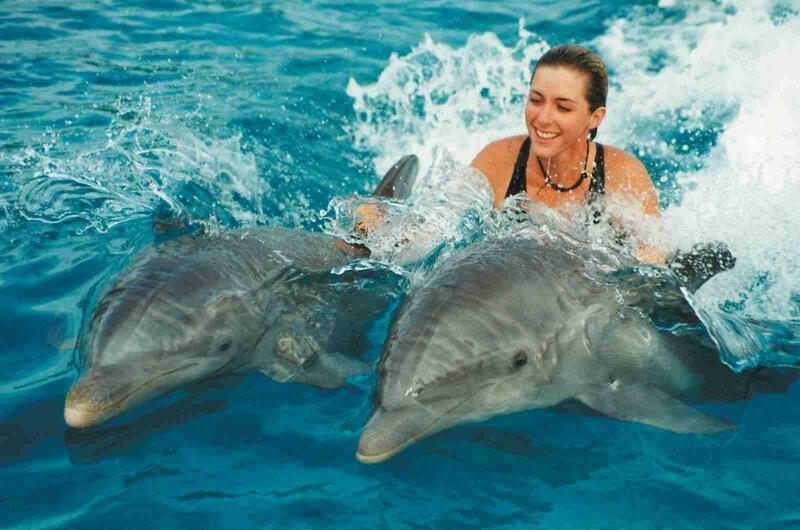 Play with the Dolphins! Who would think that you would spot a dolphin in Goa? No, I’m not kidding. Take a long boat ride and be astonished by finding dolphins for some great pictures. Palolem Beach, Coco beach, Cavelossim beach, Morjim beach are some of the beaches were you can spot dolphins. Just talk to the local fishermen and take a boat ride of a lifetime to experience the scenic beauty of nature. Want to spend some time playing with the friendly frolicking creatures then head to the Sequerim Beach which offers 45 minutes Dolphin Safari including a pickup and drop service from your stay with some snacks provided to enjoy some quality time with the sea creatures. 2. Take a long walk in the beds of Arabian Sea! Bored of walking around in your locality amidst the pollution and the noise? Experience one of the adventures by taking a walk in the seabed of Arabian Sea. All you need is a little courage to take a dip in the ocean and meet some amazing sea creatures. You are bound to spot coral, marine plants, varieties of fishes. Baina beach in Vasco offers well-trained experts to guide you. The charges are minimal around Rs.2000 per head for about 20 minutes of this least risky adventure. Try this simple adventure and you will have a new walking story for a lifetime. 3. Learn some Splash surfing! 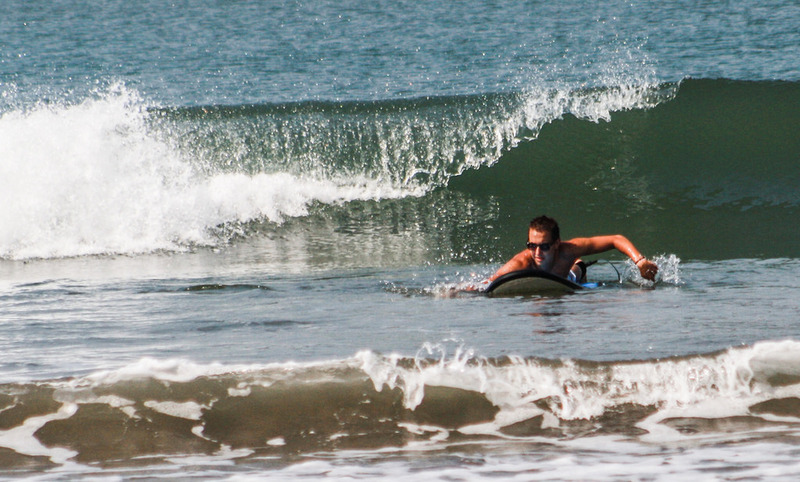 Goa is a well known for its beaches and you will definitely come across lot of foreigners surfing. Ever wanted to try your luck on the boards? Here’s the golden opportunity. The surf club at Arambol beach is just the right place to try the basic surfing lessons for around Rs.2000 If you are quite a pro and confident on trying it yourself, then rent a surfboard and have fun. Also the queen of beaches, the Calangute beach is popular for all kinds of water sports and adventure. 4. Feast on a delicious Fish thali! After trying out all the adventure sports in the soaring sun, it’s time to try some yummy fish thali which is under Rs.150 only. The delicious local fish thali consists of perfectly cooked fish fry, prawn curry and rice with various other seafood including crabs to relish from. Needless to say, a chilled beer is a must along with the spicy food. On the other hand, the sandwiches and burgers might cost you more than the fish thali. Why not try the local cuisine while you’re there? More than looking for an expensive fine dining look for shacks around the beach or the local street side food for the fish thali. 5. Shop till you drop! That’s right! Who wouldn’t want to pick up some souvenirs for people back home? Goa is well known for its street shopping. The flea market at Anjuna beach in north Goa is a perfect paradise for real shopaholics. Remember this happens every Wednesday and do not forget to pick footwear, artificial jewellery and not to miss the funky t-shirts. If you would like to carry some taste essentials back home from this place, then head to Mapusa market and shop for their varieties of pickles, spices and sausages. You can also pick up some interesting antique handicrafts from here. For some sea shell artifacts, Panjim market and Calangute Market square are the best options. 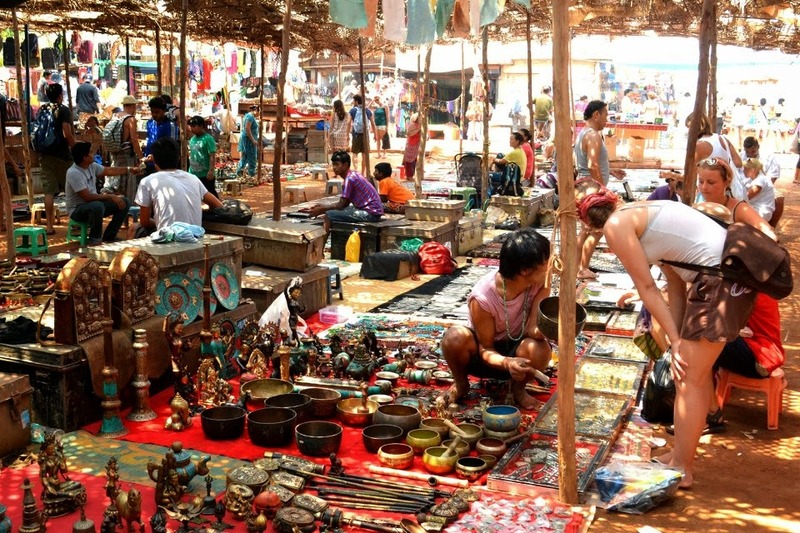 Apart from this regular kind of flea markets, since Goa is famous for its nightlife; they also host night bazaar. Mackie’s Night Bazaar & Ingo’s being the most popular ones. These markets are not just for shopping but you can also enjoy some vigorous music and some delicious food. 6. Learn the art of cooking Goan style! 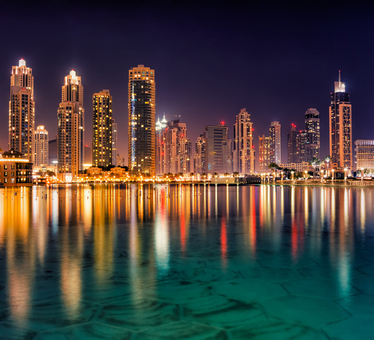 Learning something new from every destination can add up so much to your creativity. For some learning to cook in different cultures in the new form of art. One such opportunity in Goa for the seafood lovers is to learn the new culinary style at the Siolim house. A 350-year-old heritage hotel built in the Portuguese architectural form, the cooking school was born out of a passion for tropical flavours for the western foreigners. Indulge yourself for a half-day session at this beautiful place to learn the delicacies of the Goa culture with well-trained chefs to teach you the perfect combination of spices with the right kind of sea creatures to taste from. 7. Try your luck at the Casino! 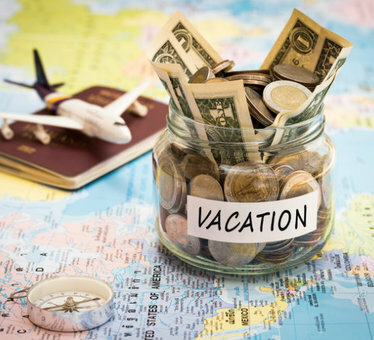 If your dream is to gamble at Las Vegas and win some big money, why not try your luck first at Goa! Yes, Gambling is legal in Goa. 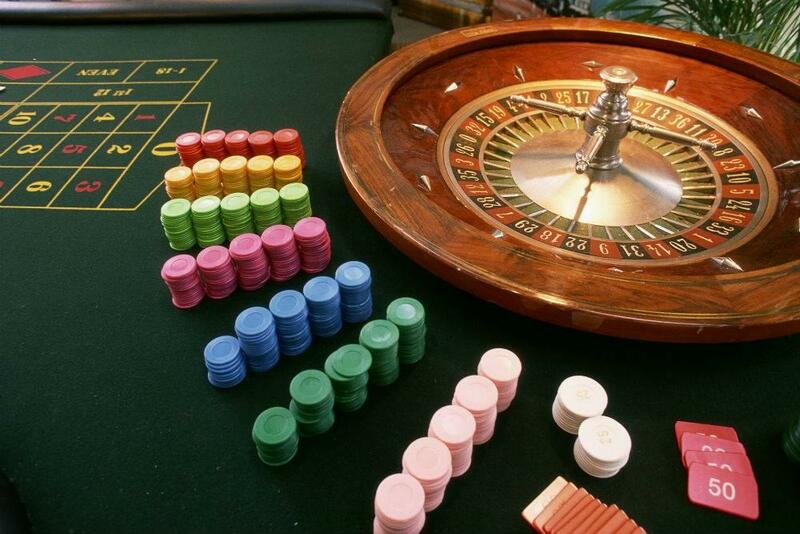 Located in the most of the posh areas, casinos are a big culture in Goa. If you want to try your luck with a spin, or a hand of blackjack, poker then this is the place for you to have some fun. Thanks to the Deltin Royale where you can sail on the waters of Mandovi River while you deal with some of the experts who play here often. These multi-level casinos are so royal with exquisite impressive interiors and posh furniture’s, I’m sure you wouldn’t want to leave this majestic place. They also have in-house restaurants to relish on some of the finest class dinings. Experience your gaming session with some professionals and try your luck. This is no less than a mini Las Vegas! Be it a permanent or a temporary tattoo, all of us has a soft spot to get inked once in a while. Fulfil your wishes with at least a temporary tattoo at the beachside. From various designs to choose from, and a painless option is to get inked. Want to try something wild and crazy, then get inked for real! No kidding. If you’ve always wanted a tattoo and are completely sure of what you want, just be brave and get inked. The best way to get rid of the pain is to get a drink and have some chit-chat along with your friends while you get inked. Be sure you’re not sloshed that you don’t regret what you’ve gotten inked later! We hope that you enjoy all the unusual activities in Goa apart from just partying and playing around the beaches. Goa has so much more than this to experience from. What are you waiting for? Plan your next visit soon and grab the opportunity of trying out everything possible. Because life is meant to be lived just once! Live is to the fullest!